In this video we will discuss about performing an insert, update and delete on asp.net gridview control using sqldatasource. We will be using tblEmployee table for this demo. SQL script to create and populate this table with sample data is available in Part 13 of asp.net gridview tutorial. Create an asp.net web application. 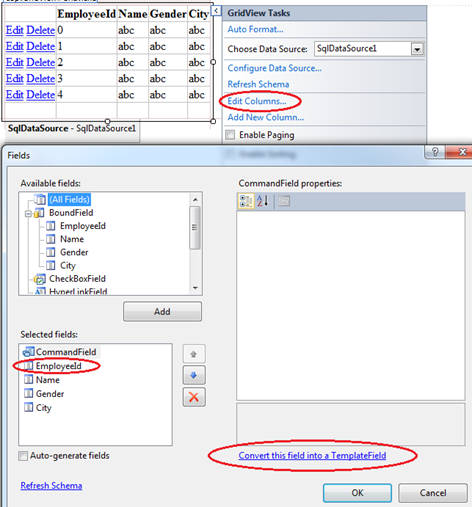 Drag and drop a gridview and a sqldatasource control on WebForm1.aspx. 3. Select "Enable Deleting" and "Enable Editing" checkboxes. At this point "Delete" and "Edit" buttons should appear on the gridview control. We will be using gridview control's footer for inserting a new record. Set "ShowFooter" property of the GridView1 control to "true". This can be done from the properties window, or in the HTML. By default GridView control has generated bound fields to display EmployeeId, Name, Gender and City columns. We need to convert these bound fields into template fields. This can be done very easily using the designer. 1. On the "GridView Tasks" pane click on "Edit Columns" link button. 1. In every TemplateField, along with EditItemTemplate and ItemTemplate, we also need FooterTemplate. 2. A dropdownlist is used in EditItemTemplate and FooterTemplate of "Gender" template field, instead of a textbox control. 3. To validate data during edit and insert operations, notice that, we are using validation controls, in EditItemTemplate and FooterTemplate. 5. We have used ValidationGroup="Insert" for all the validation controls in FooterTemplates. LinkButton's ValidationGroup is aslo set to "Insert", so that all the validation controls in in FooterTemplates are fired only on Insert LinkButton click. 6. We have set LinkButton's OnClick="lbInsert_Click". 7. After the closing tag of GridView, notice that we are using 2 validationsummary controls, to display all the validation messages in one place. ValidationSummary1 control's ValidationGroup is set to "Insert". ValidationSummary1 control displays all insert related validation errors, and edit related validation errors are displayed using ValidationSummary2 control. ErrorMessage="Name is a required field"
ErrorMessage="Gender is a required field" Text="*"
ErrorMessage="City is a required field" Text="*"
DeleteCommand="DELETE FROM [tblEmployee] WHERE [EmployeeId] = @EmployeeId"
When i worked on GridView Insert,Update and Delete using SQLDataSource, after adding the Validation field elements i got the error. I used the above code itself. I am using Visual Studio 2012. I really like the way u teach very clear and very helpful thank you so much. I have tried to use a grid-view to edit update delete and insert to a database as u put in the tutorial but in my case i need to use a tow drop-dawn box inside the grid-view the first drop dawn list refers to the other as a pass parameter to display the filtered result based on the drop-dawn selection like continent and country in the insert template but when i tried to give a parameter value for the dropdawn box the only control available in the wizard is the Gridview1 not the drop-down box can u pls help me. An error occurred during the compilation of a resource required to service this request. Please review the following specific error details and modify your source code appropriately. can you tell me how to get lbInsert_Click event directly? I am getting the error as "'DropDownList1' has a SelectedValue which is invalid because it does not exist in the list of items. Parameter name: value ". If I remove the SelectedValue then the row is not getting updated. Please suggest.. Thank you so much for your great effort. If there are no rows you cant add a first one because the footer row wont show on empty data﻿. how to solve this? This is wonderful, thanks so much for sharing.